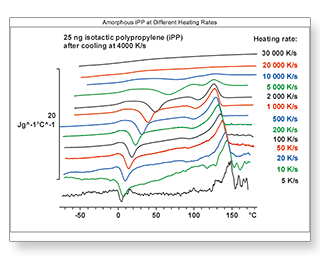 Differential Scanning Calorimetry, DSC, is the most important method in thermal analysis. 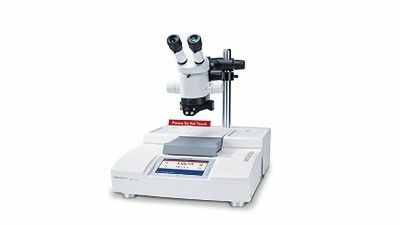 It measures the heat flow to or from a sample as a function of temperature or time and thereby allows physical transitions and chemical reactions to be quantitatively measured. Flash Differential Scanning Calorimetry revolutionizes rapid-scanning DSC. The Flash DSC 2+ can analyze reorganization processes that were previously impossible to measure. The Flash DSC 2+ is the ideal complement to conventional DSC. Heating rates now cover a range of more than 7 decades. The Flash DSC 2+ allows you to prepare samples with defined structures such as occur during rapid cooling in injection molding processes. The application of different cooling rates influences the crystallization behavior and structure of the sample. The use of high heating rates enables materials to be analyzed without interference from reorganization processes – there is no time for such processes to occur. Flash Differential Scanning Calorimetry is also the ideal method for studying crystallization kinetics. In conventional DSC instruments, the sample is measured in a crucible in order to protect the sensor. The heat capacity and thermal conductivity of the crucible however have a significant influence on the measurement. In the Flash DSC 2+, the sample is placed directly onto the MultiSTAR chip sensor. The patented dynamic power compensation control circuit allows measurements to be performed with minimum noise level at high heating and cooling rates. A complete thermal analysis system comprises four different measurement techniques. Each characterizes the sample in a different way. The combination of all the results simplifies interpretation. Besides heat flow measurements using DSC or Flash DSC, the other instruments measure weight loss (TGA), change in length (TMA) or the mechanical modulus (DMA). All these quantities change as a function of temperature. The Flash DSC 2+ revolutionizes rapid-scanning DSC. The instrument can analyze reorganization processes that were previously impossible to measure. The Flash DSC 2+ is the ideal complement to conventional DSC. Heating and cooling rates now cover a range of more than 7 decades. Take advantage of the fastest commercially available DSC – perfect for studying rapid crystallization and reorganization processes in a temperature range from –95 to 1000 °C. The ultra-high heating and cooling rates add a new dimension to the study of thermally induced physical transitions and chemical processes, for example, the crystallization and reorganization of polymers, metals and other materials. The use of high heating rates enables materials to be analyzed without interference from reorganization processes – there is no time for such processes to occur. Flash Differential Scanning Calorimetry is also the ideal method for studying crystallization kinetics. In the Flash DSC 2+, the sample is placed directly onto the MultiSTAR chip sensor. The patented dynamic power compensation control circuit allows measurements to be performed with minimum noise level at high heating and cooling rates. The Flash DSC 2+ is operated using either of the two MultiSTAR sensors (UFS 1 or UFH 1) mounted on a stable ceramic substrate with electrical connections. The preparation and insertion of a sample is performed sitting comfortably in front of the instrument. The sample is first cut to size on a small glass microscope slide placed over the sensor. A suitable sample specimen is then transferred directly to the sensor and positioned using a hair.